The third generation of smith who went by the name of Tsunahiro (綱廣) belonged to what is known as the Sue-Sôshû (末相州) period of swordmaking. 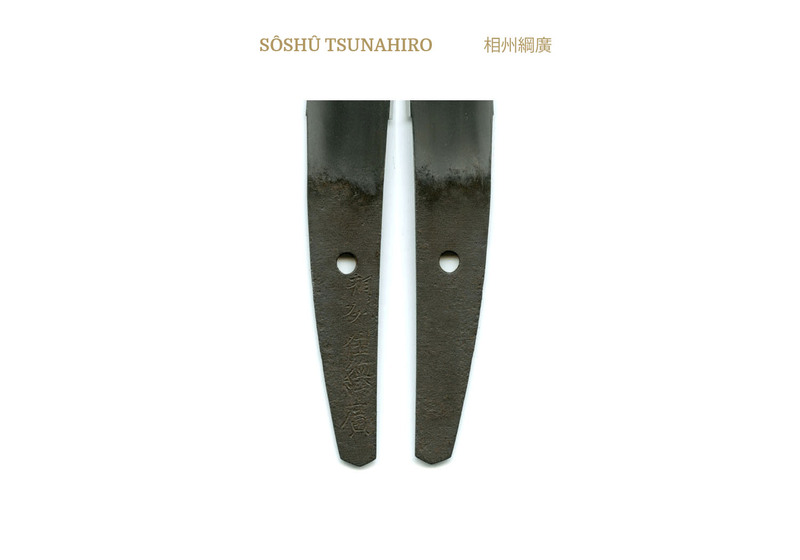 This is the name given to the Sôshû smiths who worked from the beginning of the Muromachi Era. This name corresponds to the term, Oei-Bizen (応永備前), the name given to the smiths of Bizen at this same time. The unification of the two courts was achieved in the 1392 and the fifth day of the seventh month of the following year is counted as the starting point of the Oei Era (応永)and thus the beginning of the Muromachi Period. 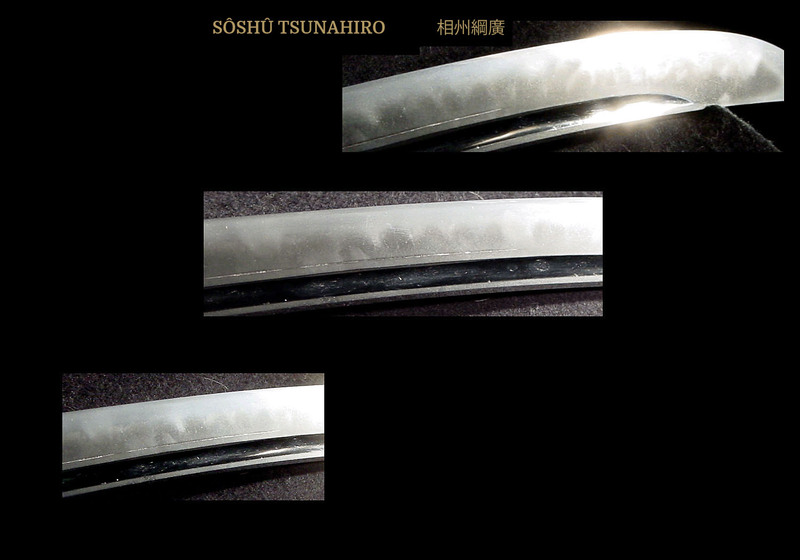 The overall workmanship of blades made in the Soshu tradition does not, as a rule, measure up to the Sôshû blades made during the Kamakura and Nambokuchô Eras. This is particularly true of the early Sue-Sôshû smiths. However, around 1532 there came a smith who is considered to be the best of the Sue-Sôshû smiths and the pillar of the Sue-Sôshû group. His name was Tsunahiro (綱廣). The generally accepted school of thought is that the yondai Sôshû Masahiro (相州正廣) received the character “Tsuna”(綱)from the Daimyo Lord of the Hôjô Kei (北條系), Hojo Ujitsuna (北條氏綱); thus changing his name to Tsunahiro(綱廣). Some believe that it was, in fact, the smith Hiromasa (廣正) who was thus honored. The final decision is still under discussion and perhaps further research in the future will decide which is correct. In either event, the quality of this smith’s work in highly regarded and thus the Tsunahiro (綱廣)line was established and would continue into and through the Shinshinto Era. The family name of the Tsunahiro (綱廣)line was Yamamura (山村) and the first generation worked in Odawara for the Hojo Kei (北條系) as has been noted. The third generation Tsunahiro’s (三代綱廣)family name was Yamamura Soumonojo (山村宗宗右衛門尉) and he lived in the Ôgigaya section of Kamakura. Later, at the request of the Lord of the Tsugaru Han of Mutsu in northern Honshû; he moved there and made three hundred daisho for this Daimyo. He finished this work in the eleventh year of Keicho (慶長)(1606) and returned to his home Kuni of Kamakura. He made works in midareba, hitatsura, and suguba ko-midareba. 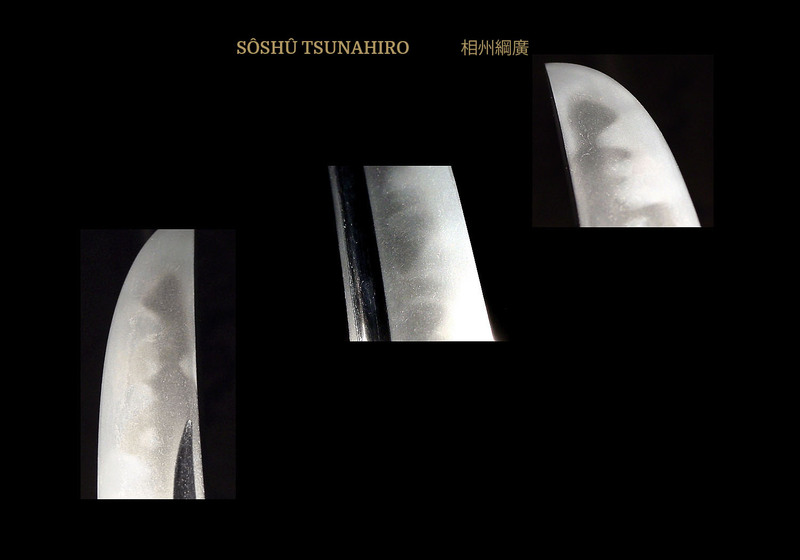 Many of his blades have horimono, as do the works of the entire Tsunahiro line of smiths. He died on the 27th day of February in the 9th year of Kanei (寛永)(1632) at the age of 91. SUGATA: As for katana there are some that are around two shaku one or two sun (about 63 cm to 67 cm), and there are also some long ones of around two shaku five or six sun (about 76 cm to 79 cm). The sori is shallow and is a saki sori style. Those in which the mihaba is wide have a tendency for the kissaki to be elongated. Tantô with about the same dimensions as in the previous period are the most common. There are various types such as some with a very strong saki zori and some with takenoko sori that are around 8 sun 5 bu (25.8 cm). 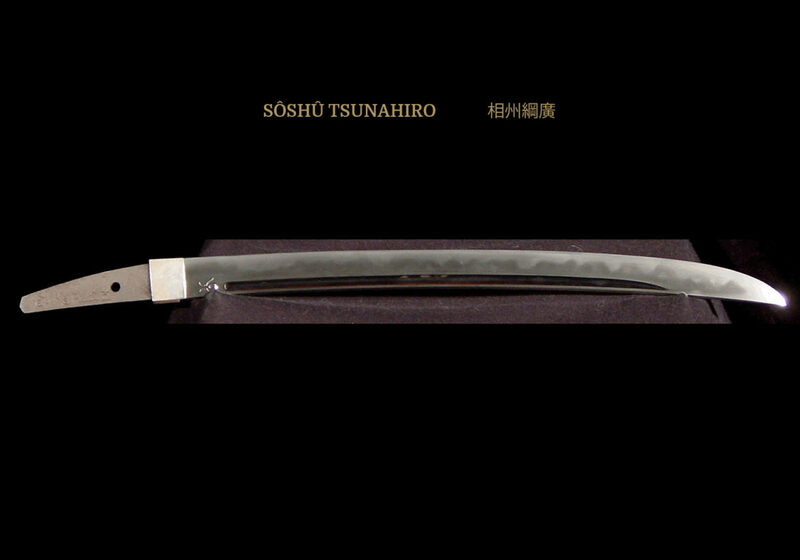 There are also some that are called sun-zumori (short) yoroi doshi in which the length is about 7 sun (21.2 cm). JITETSU: The jigane is hard and does not differ significantly from the Sôshû tradition of the earlier periods. Itame mixed with mokume hada, which is inclined to become a coarse o-hada. HAMON: He worked in several styles of hamon. Examples can be found with midare-ba, hitatsura, and suguba ko-midare. Generally, a lot of nie will not be found and when it is, it tends to be detached and uneven. BÔSHI: Tends to be midare-komi with a long kaeri. NAKAGO: Katana with kurijiri are common and tantô with the typical Sôshû style tango are also often encountered.